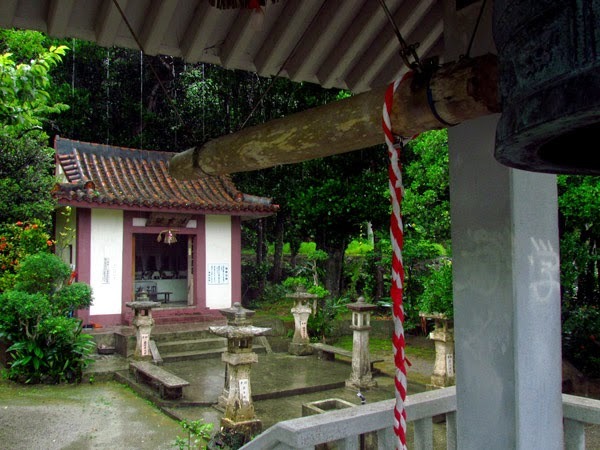 Though the temple is quite small, it was officially recognized by the Old Ryukyu government along with three of its local legends. (2)(3) The temple, and its legends, were recorded in an official document known as the Kyuu-you (or Kyuyo). 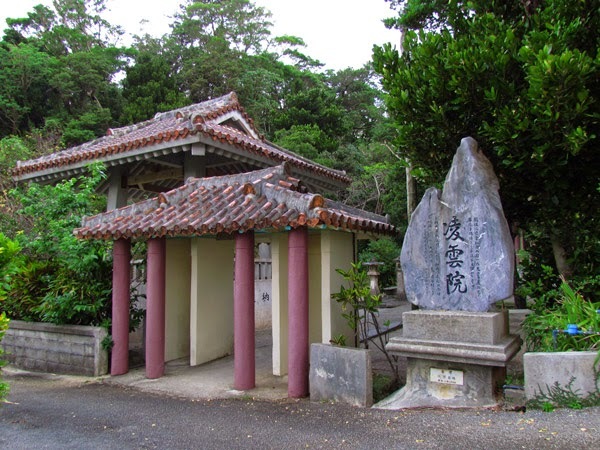 (3)(iii) It is an historical account of the Ryukyu islands that was completed in 1745. James Robinson author of the book, Okinawa: A People and their Gods, published in 1969, also writes of one legend that have similarities to those in the official record. It's not certain if his account was derived from local villagers or from official documents belonging to the Ryukyu government. The following is a breakdown of those legends. Legend One. (3) In the year 1692, drought had plagued the village of Yabu. Around the same time, sporadic fires too had wreaked havoc on the village. In an act of desperation, a Buddhist monk by the name of Ryun Washo was asked to bring prosperity to Yabu. The monk granted their request and prayed for seven days on a large stone at the base of the hill. On the seventh day rain had finally come saving the village from despair. The once problematic fires too ceased their torment on the townspeople. In his honor and to show their gratitude the villagers erected the small temple. 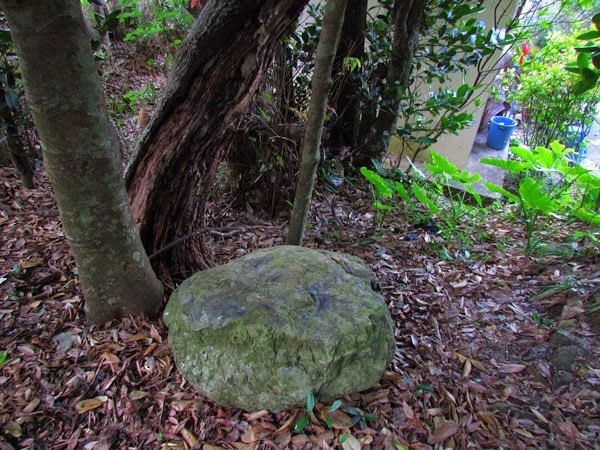 The rock that Ryun Washo had meditated on still sits behind the temple untouched and unmarked. It sits inconspicuously in its natural environment. A documented photograph can be found on page 51 of the Yabu Historical Chronicles. (2) An photograph taken in December 2014 is shown here. Legend Two. (3) Behind temple lived a very large snake up in the hills. It was said that this snake could blow fire from its mouth. The people frantically requested help from a Chuzan kingdom lord. The lord agreed and dispatched a man by the name of Kinjo-san from the Tenkai Temple [Note. It wasn't clear by the translation if Kinjo-san was a monk and it is not certain by the author where the Tenkai Temple is located]. Kinjo-san prayed fervently and the snake was defeated. Later, Kinjo-san had placed a large statue of Buddha inside the temple to mark the occasion. [Note. The statue is believed by the author to be the one in the middle seen in this picture]. Legend Three. (3) One day a Buddhist monk from Shuri had visited the temple. He had said that the large hill behind the temple showed great promise [perhaps indicating its spiritual value, author assertion]. However, he said that there was a split within the hills that resembled a snake's mouth. He declared that this was a bad omen under the concept of Feng Shui (Fu Sui in Japanese). (iv)(v) However, to offset this premonition the monk then placed seven statues of Buddha inside the temple to thwart off any misfortune. 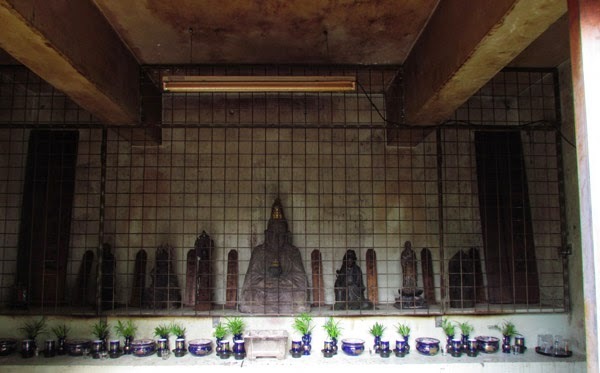 [Note: those statues can be seen here inside the temple]. After his work was completed, the monk decided to return to Shuri. A man from Yabu was sent with him to assist with his belongings. When they arrived back to Shuri, the monk had made a prophetic comment to the Yabu villager. He said, “tomorrow will be my death, so today please eat from the ufurunme [a type of hospitality dish?] on my behalf before you return to Yabu". (vi) As foretold, the monk passed away the very next day. Local Ceremonies. On October 15th of the old calendar (kyureki/lunar calendar) some of Yabu's elderly and prominent townspeople preside over prayer ceremonies within the district. Ceremonies are held at 10 different places in sequential order. 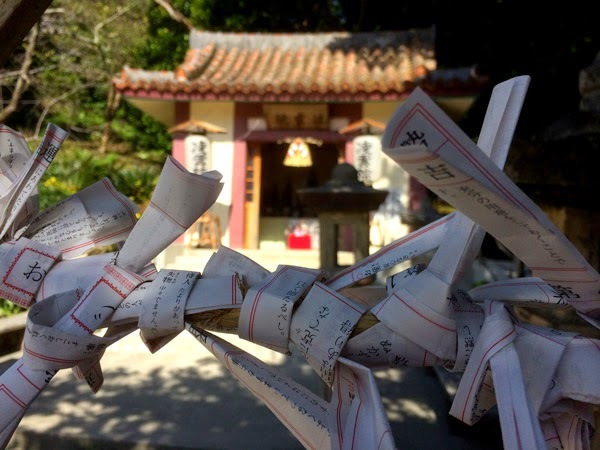 It is to give thanks and to pray for the the town's prosperity. The Yabu Temple is third in the order of ceremonies. (2) The ceremonies are typically lead by a kaminchu, a term meaning spiritual leader in the Okinawa language. Local Villagers, as well as some from the nearby area, come to the Yabu Temple to celebrate New Years Day. A small ceremony starts around 2345 (1145pm) on December 31st. For those who wish to attend the Yabu Temple during New Years, below is the general sequence of events to help you through the process. General Sequence of Events. Please note, the Yabu Temple is not a Shinto Shrine. 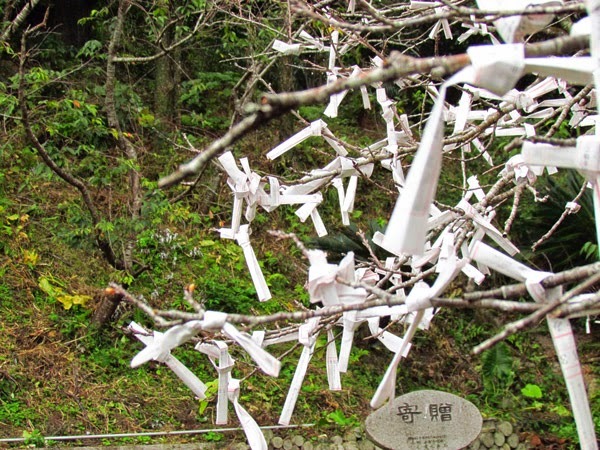 However, there are similarities to attending both temples and shrines during New Years. The Yabu Temple is small so the process is typically is more simplified. 1. Entering the Premise. There is a small gate entrance. This is not a torii gate. However, the gate does alert visitors they are entering a sacred area. 2. Purification Fountain. There are no purification fountains at the Yabu Temple. Typically, these kinds of fountains are found at major Shinto Shrines. 4. Approaching the Temple. Typically there will be a line to approach the temple. As you approach the temple you will notice a saisen, a box where you deposit monetary offerings, anywhere from 5¥ to 100¥. 5. Prayer. Normally, you pray after you make your monetary offering. Most people bow and clap twice and say a small prayer in silence. Some may just fold there hands. 6. 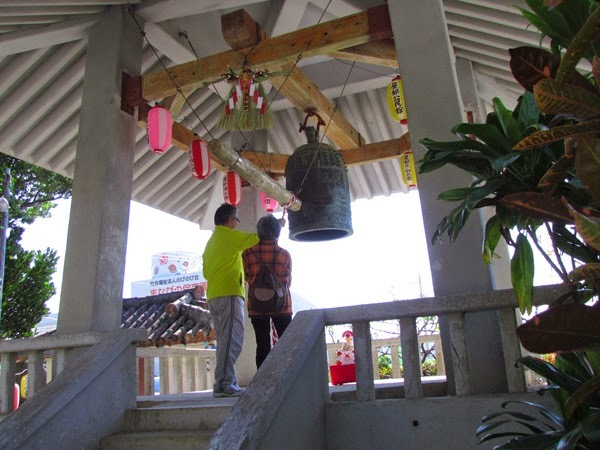 Ringing of the Temple Bell (optional). After you have said your prayers, individuals, couples, or family members are welcome to ring the temple bell. For proper etiquette, this is just done once as an entity. i. 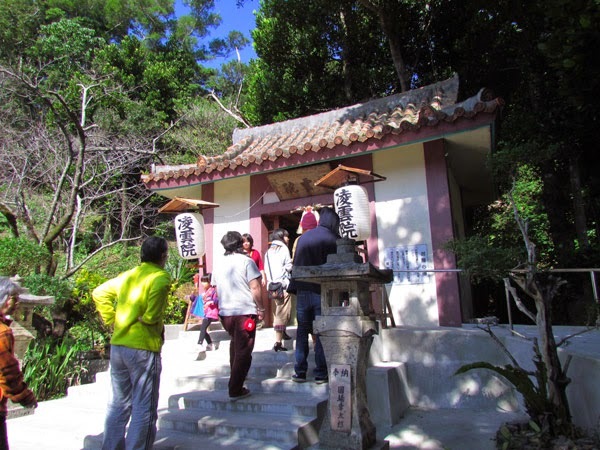 The references stated that the original temple was destroyed during the Okinawan War but it did not specify details as to who or what caused its destruction. ii. In James Robison's research he states that the temple was rebuilt in 1957. 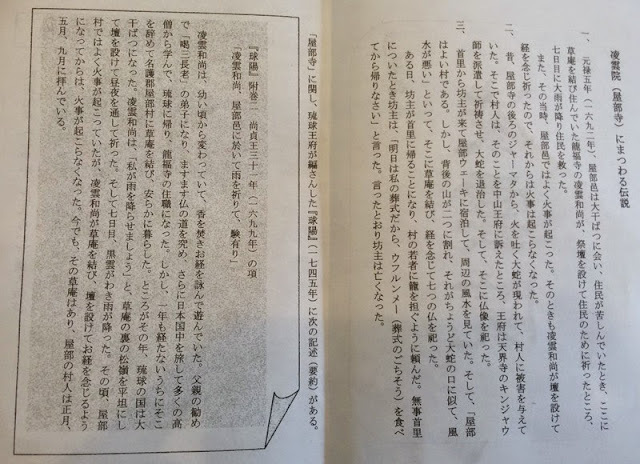 However, the Yabu Historical Chronicles, a more recent publication, states it was rebuilt in 1956.
v. It's not certain where this split or "snakes mouth" is in relation to the temple. 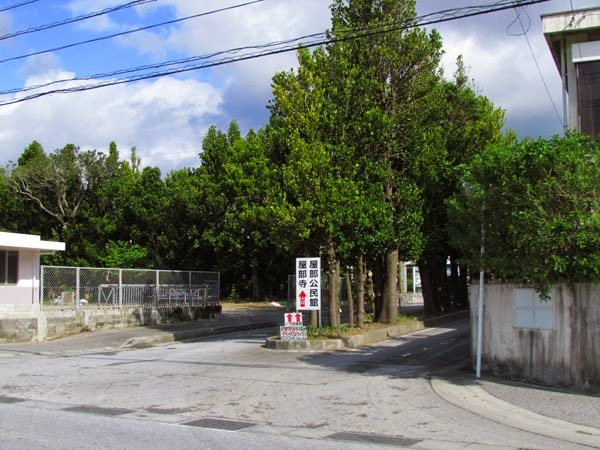 There is a split (now a road) that goes between two hills next to the Yabu Temple. See picture here. vi. The term ufurunme could not be found in any official resource. But interviews with Okinawan people have lead us to believe it is an Okinawan word meaning some kind of hospitality food. The latter suffix -me can mean food in the Okinawan language. Additionally, during some Okinawa funerals, family members of the deceased eat from a specially prepared meal called usande (ウサンデー) . It is not certain if the two terms have identical meaning in this context. It was theorized during this research that ufurunme could possibly be dialect from an aristocratic society, such as that found at Shuri during the Old Kingdom. As stated, there are no official references as of yet to support any of this. Parking/Amenities. Parking. You will have to park somewhere off to the side of the road near the temple grounds. There is a parking field across the from the temple but it is own by the nursery school and gated. It may be open for the New Years. Amenities. 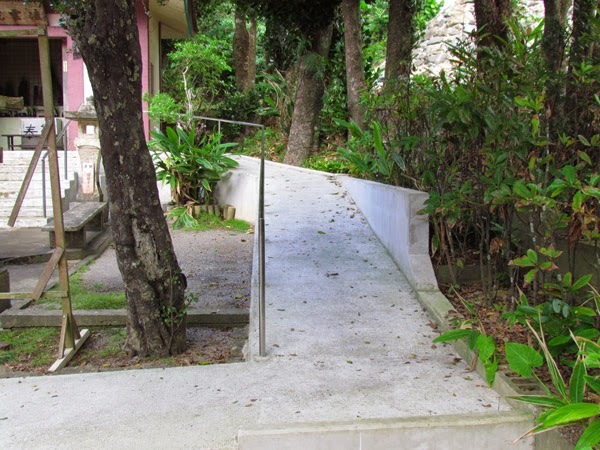 There is a walk ramp leading up to the temple for baby strollers and those using a wheel chair. Directions. 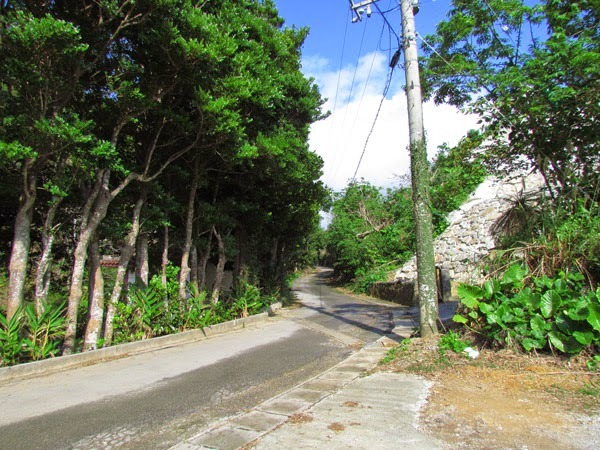 Take Highway 58 into Nago City. Then take Highway 449 (coastline) going towards Motubu. Please study the map carefully. You will pass the Yabu Post Office (on the right) before you reach the turn-off (on the right), about 400 meters later. The turn-off is not easily recognizable. Warning. You are more likely to pass the turn-off the first time around. Be careful of making sudden stops as you see the turn-off. It will sneak up on you. See picture of turn-off here. In the interest of safety, if you pass it just turn around later. Avoid making sudden stops. There typically is a high volume of traffic on the main route. From the turn-off, follow the Blue Vehicle route designated in the map above. LandMarks (yellow diamond icons) have been placed to help you reach the temple. 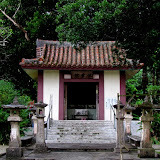 Related Articles (Snake Legends of Okinawa). The Matsuda Cave & Mega Gama Ruins, Legend of Yara Muruchi.